A crowd in excess of 20,000 piled into the East Melbourne ground for what promised to be an exciting encounter. 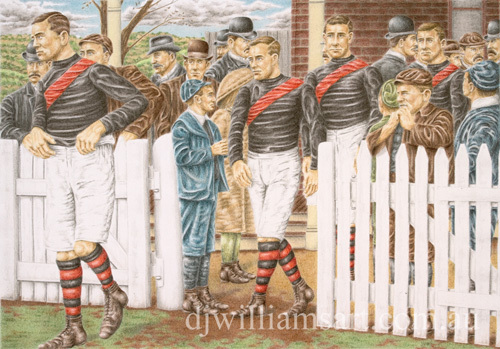 Essendon captain, Bill Griffith, won the toss and had no hesitation in kicking with the strong breeze that was favouring the railway end goal. Essendon was taken aback when South Melbourne dominated play from the opening bounce. It was clear from South’s brilliant display of team football that the players had been carefully drilled. The red and white kept the ball out wide of the fray at every opportunity and ran forward along the wings. A final kick would then see the ball centred to a position within goal-scoring range. South Melbourne made several such rushes for little result until Gough was finally found only yards from goal and had no difficulty in snapping the ball across his body for the first goal of the match. After what had been a sluggish start, the Essendon players began to slowly work their way back into the contest. The forwards were given a number of chances to draw the team level, but the normally reliable Shea and Martin failed to raise the goal umpire’s two flags. Essendon would soon pay for its inaccuracy in front of goal. The ball was carried the length of the ground by South Melbourne with a series of brilliant exchanges before Casey entered the fray for the visitors and won the ball in a willing crush. He dropped the ball to his boot and sent it straight between the posts for his team’s second goal. The crowd had little time to reflect on the goal before Casey had scored again just a minute later. To the delight of the club’s supporters, Essendon regained its composure and mounted a spirited counter attack. Led by the Essendon followers, the ball was worked forward in the midst of a heated crush until Shea was found in front of the posts with a well directed pass. The half-forward took a strong mark then made no mistake with his kick to register Essendon’s first goal on the board. Soon after, Essendon rover, Mick Londerigan, who had been closely shadowed by Barry for much of the first term, found a way to break free from his guard and kick Essendon’s second goal. With their team now trailing by just three points, the Essendon crowd reacted accordingly with a round of hearty cheers. With just a minute left remaining before the first bell, South drove the ball forward for one last shot on goal. It was Casey who was provided with the opportunity and he did not let his team down. At quarter time, the home team was trailing South Melbourne by nine points. The Essendon players had failed to make use of the strong breeze and were unable to use the ball with anything like the precision that was shown by their opponents. With the breeze set to favour South Melbourne in the second term, there were few in the crowd willing to give Essendon any real chance of victory. The next three quarter did not, however, follow any prior forecast and instead, the crowd was treated to one of the best games of football seen on the East Melbourne ground for many years. The final result would remain unclear until the very last kick. Full details of the three remaining quarters are currently being compiled and will be made available once completed.